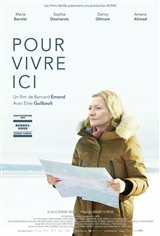 Shaken by the sudden death of her husband, Monique, a retired nurse, wanders aimlessly through the snowy streets of Baie Comeau. At the funeral, she rekindles a relationship with her late son’s ex-girlfriend Sylvie, who lives in Montreal. With her two living children also now in Montreal, Monique decides to go spend time with them. But her son, an overworked architect juggling the demands of shared custody, has little time to devote to her. Monique finds even less comfort with her journalist daughter, who suddenly has to leave the city on assignment. Monique calls on Sylvie, who gives Monique the opportunity to share memories of her late husband, whom she misses desperately. During their time together, Monique decides to ​​take a road trip to her hometown in northern Ontario, where she hasn’t set foot since her adolescence, in search of inner peace.